Good morning. The Eagles finish the preseason on Thursday against the New York Jets, and then begin a busy week leading up to the season opener against the Atlanta Falcons on Sept. 6. Doug Pederson is getting closer to finalizing his decision on the Week 1 starting quarterback. This is a preseason edition of the Early Birds newsletter, which moves to a daily format next week. If your friends haven't subscribed to Early Birds, it's free to sign up here. I want to know what you think, what we should add and what you want to read, so send me feedback by email or on Twitter @ZBerm. Thank you for reading. 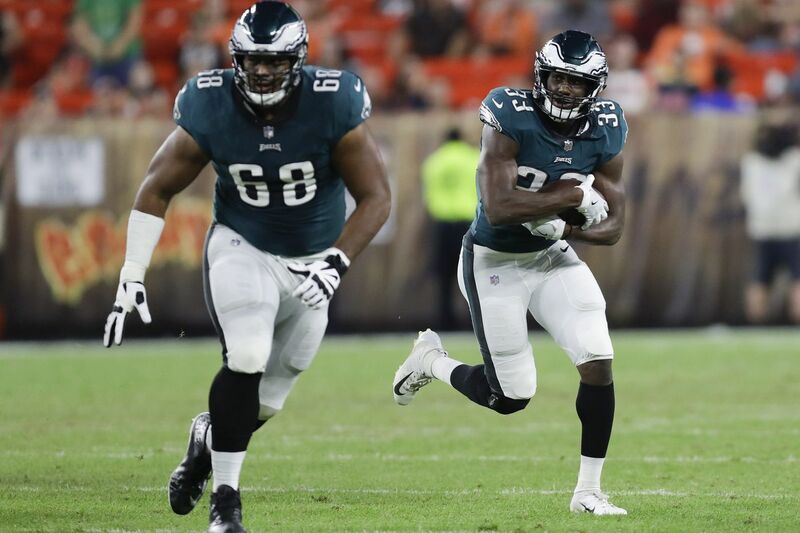 Running back Josh Adams runs the ball behind offensive tackle Jordan Mailata during the Eagles’ third preseason game, a 5-0 loss to the Browns. The starters and main contributors will not play, but Thursday's game will be the final evaluation for the last few roster spots. The Eagles will need to determine their fourth running back, potentially their sixth wide receiver or fourth tight end, their fourth defensive tackle and their fourth safety, among other positions. The evaluations won't be made entirely off this game, but it will be the final impression. "It's just about seeing these guys one last time in this type of environment when things are kind of flying around," coach Doug Pederson said. "They didn't get a lot of snaps last week, and so just want to make sure that as personnel staff, coaches, we're doing our due diligence that when we eventually get to the 53 that we're not missing anybody." It's not just opportunities for younger players. Veterans such as Chance Warmack, Markus Wheaton and Wendell Smallwood will try to land on the right side of the bubble. The Eagles must cut the roster to 53 players by 4 p.m. on Saturday. The Eagles want to see running back Josh Adams in a featured-type role on Thursday. Adams, a former Central Bucks South and Notre Dame standout, has impressed throughout the summer after missing time in the spring with a foot injury. In two preseason games, Adams rushed 10 times for 66 yards. That workload will increase against the Jets. "Want to maybe get him involved in this game a little bit early and see what he can do," Pederson said. "He's another bright spot, young player that's made an impact." Adams might have gone undrafted, but the 6-foot-2, 225-pound rusher is showing signs of what made him productive at Notre Dame. A good game could solidify a spot on the roster as the fourth running back; the Eagles might not be able to pass him through to the practice squad. The Eagles could also consider keeping five running backs. Smallwood, Donnel Pumphrey and Matt Jones are in competition. Pumphrey will make his preseason debut. Future starters on the offensive line? The Eagles spent their final two draft picks in April on developmental offensive linemen: Matt Pryor and Jordan Mailata. Look for both to make the team. They've impressed this summer and have rare size and traits. Mailata (6-foot-8, 346 pounds) and Pryor (6-7, 338) have different playing backgrounds – Mailata, a former rugby player, has only played football for a few months; Pryor started at TCU – but they both could become future starters, maybe even next to each other. However, if injuries don't plague the offensive line, Thursday could be the final time for significant snaps this year for the pair. Halapoulivaati Vaitai and Isaac Seumalo appear locked in as the top reserves, so Pryor and Mailata project as healthy scratches on game days once the season begins. Christian Hackenberg won't make the 53-man roster, but he'll nonetheless be interesting to watch on Thursday against the team that drafted him in the second round in 2016. The former Penn State standout has not played in a game this preseason. Pederson said Hackenberg will play on Thursday. It'll be the first time he can show the throwing mechanics he refined during the offseason. Only 23, Hackenberg might enter consideration for the Eagles practice squad with a good performance. Joe Callahan will also get time on Thursday. Pederson is leaning toward starting third-string quarterback Nate Sudfeld. Cameron Johnston has remained the only punter on the Eagles roster this summer, and he'll try to ensure it remains that way this season in Thursday's game. Pederson said Johnston "has really improved over the last couple weeks," citing his get-off and hang times. Johnston has shown his big leg during the preseason. Consistency is the question. The Eagles can scan the waiver wire to see who is let go elsewhere, but they've invested time in developing Johnston during the past two summers. The reward could be a roster spot. Christian Hackenberg will get a chance to showcase what he’s learned with the Eagles during Thursday’s final preseason game. There were updates on Carson Wentz, Alshon Jeffery and more on Tuesday. Jeffery will reportedly miss at least the first two weeks of the season. Doug Pederson will know the starting quarterback on Friday, but he might keep it private. Joe Callahan is used to life on roster limbo, Les Bowen writes. Thursday will likely be Callahan's final game in an Eagles uniform. Doug Pederson turned up the heat at practice this week, Jeff McLane writes. Corey Clement is back at practice and in a much different situation than this time last year. Jordan Mailata's rapid development appears to put him position to make the 53-man roster, Paul Domowitch writes. Listen to the latest Birds' Eye View podcast. is Josh Sweat a lock to make the team? Barring injury, yes. I don't see the Eagles cutting a fourth-round pick, and Josh Sweat has considerable potential. You see the athleticism around the edge. He can refine his pass-rush moves, but he has size and athleticism that cannot be taught and he fits this defense. I think the Eagles could try to trade Steven Means, but if they don't, I still think they keep six defensive ends. Brandon Graham, Chris Long and Michael Bennett are all over 30. The Eagles need to think about the future at the position. Sweat is only 21. He's a player the Eagles will develop this year, and it could pay off in 2019 or 2020.